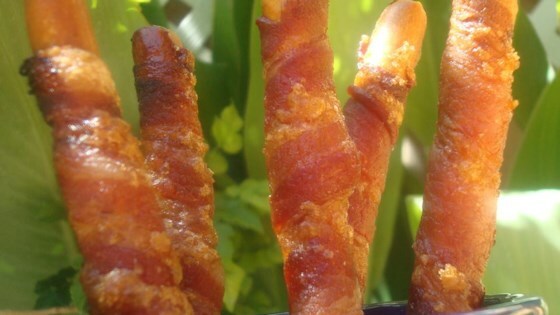 "Bacon on a bread stick makes this lower calories than bacon on a smokie and it's so good!" Preheat oven to 325 degrees F (165 degrees C). Line 2 baking sheets with aluminum foil or parchment paper and spray with cooking spray. Wrap 1 bacon strip around each breadstick, leaving about 1 inch uncovered on each end. Place wrapped breadsticks on the prepared baking sheet. Sprinkle brown sugar evenly over breadsticks. Bake in the preheated oven until bacon is crisp and browned, 50 to 60 minutes. Cool breadsticks on a piece of parchment paper or waxed paper sprayed with cooking spray. Some people like to combine 1 cup light brown and 1 cup dark brown sugar before sprinkling on the bacon sticks. Four stars because this gets messy and takes some time to wrap the bacon. Can be made a day ahead. They were ok. I couldn't find Alessi brand breadsticks so I used the shorter ones I found in my local grocery store. They were fine, just nothing wow. I mixed light and dark brown sugars.